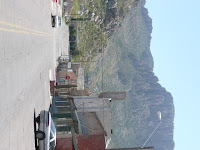 On my free Sunday I went to visit the town of Superior in Arizona. This was a copper mining town in its heyday but now it is a neglected little town. (With copper prices the way they are today one would think it could make a come back but apparently the company that runs the mines has a history of serious polluting. ) In any case, it was HOT and muggy but the town offered a lot to paint. So much so I settled for the picturesque Main street which was a mistake of sorts since there was not a lot of shadow and I was pretty miserable. I did meet some of the people that live in Superior and its tough economic and environmental climate. Some of them are artists as well. One gentleman invited me to his studio but I had the intention of painting as long as the sun was up. I left for Kearney and saw first hand how whole mountains have been reduced to dust due to massive mining operations. When I came back to visit at 7:30pm it was definitely late but I was newly amazed at the amount of painterly matter in this town. Dilapidated structures and mining chimneys, the magnificence of the "Apache's Leap" peak as a backdrop, small churches by the road...a definite return if I am ever in those parts. And for everybody's information, Geronimo never jumped to his death from any mountain, he died of pneumonia in Oklahoma. Sorry about that.